A superb highlight of the main Saturday sale is at Lot 152. A one of a kind firearm is up for auction, which is Annie Oakley’s gallery rifle, with trophy and photos. This is a Remington 12B “Gallery Special” and the trophy was won in North Carolina. The Remington is a .22 RF short, 24” part octagon barrel with stock of select American walnut with natural dark stripping, and a straight grip. This one of a kind item is an important piece of history and is in fine condition. It is believed to be the only Annie Oakley gun able to be identified in a photograph. An extensive description of all pieces in this lot, and a fabulous array of photos is available on the online catalog. Another historically important group of items are up for auction at Lot 180. 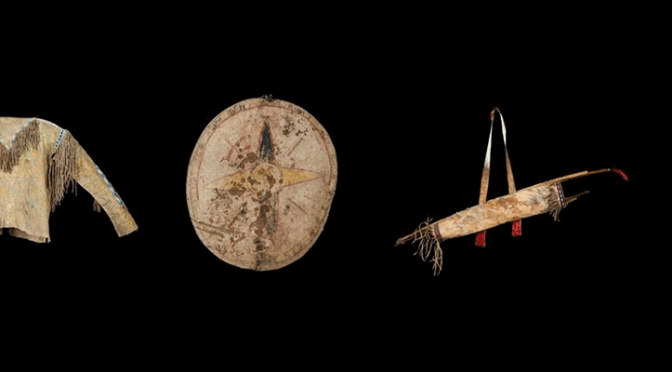 Here is a Mescalero Apache Collection with shirt, shield, leggings, bow case, and quiver set. A grouping like this is very rare and unique at auction. It was collected circa 1870’s and has been held in a single family for 140+ years. The shirt is Native tanned hid with fringe decorations and some minimal beadwork, while the leggings are beautiful with white edge beading along the outside and lower edge of the flap. The shield is made of hardened buffalo hide and is an excellent example of the quality of the time period. All items in the lot are selling for one price and photos and extensive descriptions are available online. Yet another firearm of historical value is available at Lot 240. This one is Cherokee Bill’s Winchester Model 1886. Circa 1888, this rifle is a .38-56 with a 26” octagon barrel. The bore is in very good condition, and the rifle is in overall good condition with a few dings due to use. The provenance of this rifle is outstanding and it is rare to see a rifle like this up for auction. Included in the lot are also some various pieces of memorabilia such as cabinet cards and a lithograph.